Most of us have to choose between Indian and Chinese takeout. In White River Junction, you can get both at once — in the same dish. At Taj-E-India Catering & Take Out, which opened in February, Bakhtawar Singh cooks up both his native Indian and Indo-Chinese fare. Not far from Exit 12 on I-91, the Singh family leaves its back door open for orders from noon to 8 p.m. every day. While most customers simply come seeking Indian food in an area not known for rich subcontinental cuisine, it’s the Indo-Chinese offerings that make Taj-E-India unique in Vermont. Singh’s fusion belongs to a long cultural tradition: Practically anywhere you travel on the planet, you will find Chinese food adapted to suit local tastes. In Puerto Rico, French fries are mixed with fried rice and sautéed chicken or shrimp. Americans will recognize kara-age and gyoza, Japanese blends of native and Chinese cuisine. Not all fusion works, of course; plenty of Asian restaurants that serve multiple cuisines end up doing none of them well. But the stars seem to align for the ascending Indo-Chinese food, first popularized in the city of Kolkata. To grasp the two cuisines’ compatibility, you need only to compare the heat of Szechuan food to an Indian vindaloo, or the aromatic mix of spices in garam masala to Chinese five-spice powder. Guests at Taj-E-India may get a whiff of those scents as they wait for their food orders on the silk fainting couch in what was once Singh’s eldest child’s bedroom. When she left for college, he converted it into what feels like an exotic dentist’s waiting area. Customers watch Indian music videos or movies on a flat-screen TV as they await their meals. Meanwhile, just past the family’s home kitchen, Singh labors in his professional cooking space. An industrial-size saucepot bubbles with saag while he threads skewers of marinated chicken into the metal-girded clay tandoor to cook at close to 900 degrees. A chef in India, Singh came to the United States nine years ago on a work visa that allowed him to cook at his sister’s restaurant, Jewel of India in Hanover, N.H. He wanted to escape the crime in his native Punjab and improve his children’s prospects. “Our parents’ motivation was to give us a better education. Better future, better jobs,” says Singh’s 16-year-old son, Interjit Singh, referring to himself, his older sister and his 10-year-old brother. “They are all good in their studies, and we are happy,” says Bakhtawar Singh, whose English is fluent, if a little tentative. Interjit helps his father by answering phones and taking orders when he’s not at school. At the beginning of 2010, two years before Singh opened Taj-E-India, another of his sisters moved to New York. To help her and her husband make the transition and learn English, Singh left his wife and kids in White River Junction and moved in with his extended family. Indo-Chinese cuisine makes for fascinating ethnographic study. While most American Chinese food is adapted from Hunan and Cantonese cuisines, Indians lean most heavily on dishes from the southeastern Chinese Hakka ethnic group. These are sweet, savory and decidedly meaty, posing difficulties for many Hindus, Jains and even some sects of Sikhs. While many Indians, including the Singhs, consume meat, the most popular Indo-Hakka dishes replace chicken or duck with homemade paneer cheese or vegetables. At Taj-E-India, Singh offers several dishes in both saucy and “dry” iterations. 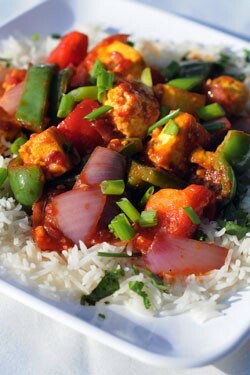 Dry paneer chili is served in a spicy, cherry-red paste with cubes of peppers and onion. A slightly sweet, almost fruity top note gives way to aromatic, cinnamon-spiked garam masala. It’s followed by a wallop of spice that, while fiery, never approaches a level of discomfort. The “wet” version of the dish is the same, but sits in a soy-based gravy. Another dish that follows this pattern is Gobi Mancharian, featuring cauliflower fritters in place of the more traditional Chinese chicken in both the wet and dry versions. Despite the presence of such exotic dishes, not all of Taj-E-India’s Chinese choices will taste foreign to Vermont diners. Singh’s Hakka noodles are a satisfyingly oily, umami take on familiar veggie lo mein. The only difference is a subtle heat that builds at the back of the throat with each slippery bite. And not just among locals. Recently, one Burlington woman tried Taj-E-India while visiting family in the Upper Valley and ended up bringing an additional $90 worth of food home with her. Singh’s saag paneer, one of his personal favorites, is particularly worthy of a trip. Though big chunks of homemade cheese aren’t browned before stewing, they retain a pleasing bounce. The spinach sauce itself is creamy and studded with cumin seeds. Just a whisper of heat in the homey dish warms the palate. Singh says he looks out for customers another way: by using olive oil to sauté his food, rather than less healthy but more common vegetable or peanut oil. A lush hint of olive flavor blends with ginger and garlic in most of his dishes, both Indian and Chinese. Happy diners are repaying Singh with great word of mouth. When the take-out eatery first opened, Singh says, he took out a pair of ads in the Valley News. While he wasn’t satisfied with their yield, business boomed before long without the benefit of print. On a recent Thursday, Taj-E-India got about five phone orders just between 2 and 3:30 p.m. Each time, chaos erupted in the home as Singh or his sons ran for the phone. Singh’s father was in the hospital with pneumonia that day, and the chef and his wife were trying to get on with the business of running a restaurant while raising a busy teen and a 10-year-old. The Singh kids don’t just help take orders: They’re an ideal test market. “My sons, they act like American people, and they eat what American people like to eat,” Singh explains. “I tell them, ‘I made the dish, and if you like, a lot of people will like.” He consults his own palate, as well; every dish, he says, needs approval from both his Indian tastes and his sons’ Americanized ones. When he moved to the States, Singh says, he never imagined he would make so many American friends — and gain so many fans. “People say, ‘Your food is best in Vermont,’” he says. “Some nice words. We’re very happy to hear from them. “People nice here,” Singh adds of his neighbors. “If you are nice, then people’s nice — that depends on you.” Maybe being nice is part of it, but spicing up the lives of locals surely can’t hurt.